Contact Jerry to be put on waiting list! Contact Phil to be put on waiting list! Click here or on the Thunderbird icon to enroll in a TSC class. 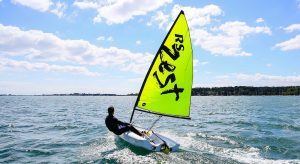 These one-week programs will teach beginning sailing in our new RS Tera and RS Zest fleet. No previous sailing or boating experience required. 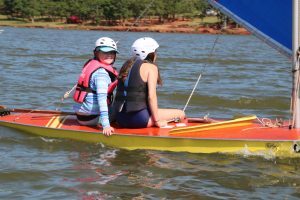 Student learn the safe, responsible way to rig, launch and sail small boats, while improving their self-confidence, coordination and teamwork. Our all-volunteer instructors are certified by U.S. 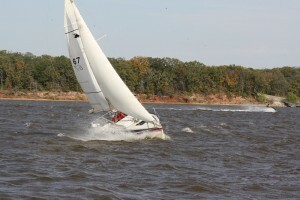 Sailing and follow nationally recognized standards. Classes run 9:00 AM – 3:00 PM, Monday thru Friday. Kids bring their own PFD, lunch and drinks. $200. Students are encouraged to repeat the class a second year. 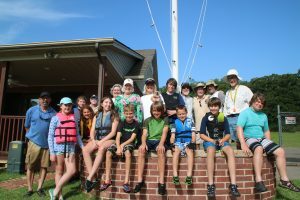 Third year students should take the “Sailing Better” Intermediate Camp. 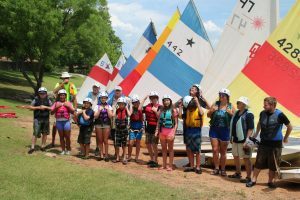 The 2019 season will be the 18th year of The BoatHouse’s nationally recognized program graduating over 400 youth from Norman and surrounding communities. Prerequisite is the ability to swim 50 feet. Graduates receive awards and certificates at a ceremony for parents and friends on Friday, the last day of camp. Scouts may receive the sailing merit badges. Register and pay online, or Mail check to Lake Thunderbird BoatHouse, PO Box 1652, Norman, OK 73070-1652. You may also bring check with you on the first day of class. But be sure to confirm with the primary instructor of your class. 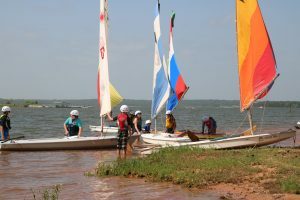 The Sailing “Better” Intermediate Camp – Ages 9-14. Three days of instruction build on the knowledge and skills learned in the Sailing Smart Camp. Students will improve sailing on all points of sail, especially upwind. They will be introduced to racing, including the rules, the start, and sailing the course. Weather permitting we will take a longer destination sail. Boats may include prams, Lasers, RS Tera, RS Zest, the American and Harbor 14 sloops, and perhaps a larger keelboat. Instructors are US Sailing Small Boat and Basic Keelboat certified. Classes run 9:00 AM – 3:00 PM, Tuesday – Thursday. $150. Prerequisites: Sailing Smart Camp or equivalent. Ages 9-14 year-old. Camp members should be able to float or tread water for at least 1 minute and swim 50 feet. Campers must have a well-fitted life vest, worn when on the waterfront, dock, or boat. Please bring a sack lunch, water bottle, and sunscreen. Taught by US Sailing Small Boat Level I Certified Instructor. LEARN TO SAIL on our O’Day 24(Shamrock) and Capri 22. For age 16 and up, no sailing knowledge required. This class leads to US Sailing Basic Keelboat certification. Six students maximum. Spring 2019 classroom sessions will be held Thursday nights April 18, 25, and May 2, 6:00 – 8:00 PM. Dates for eight hours on-the-water training will include April 21, 22, 27, 28, or May 4 and 5, weather permitting. Taught by US Sailing Basic KeelBoat Certified Instructors. $300.